We knew from the very beginning that taking on a project related to natural cosmetics would be a great experience, and that the open-mindedness of our clients and their approach would enable us to implement a number of highly interesting solutions. Our mission was to develop a comprehensive visual identity for the brand and to design and implement an online e-commerce platform. When creating the brand identity, we were to bring together the natural, organic character of the cosmetics, openness to client needs, and an ever-expanding product offer that satisfied even the most demanding customers. 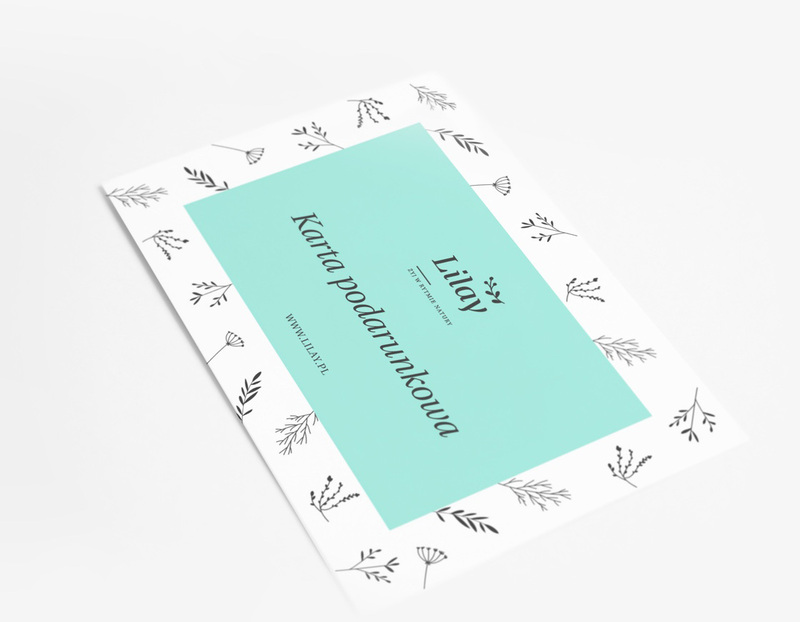 Designing the logo for Lilay, we knew we needed a symbol that would represent both the natural, organic quality of the brand’s products as well as its stability and progressive approach. The typography we selected is clear and distinct, its discrete curves and notches emphasizing the brand’s subtle character, blending resilience with nature and tranquility. The slanted lettering made the design feel lighter, flexible and dynamic. The small sprig, placed above the typography and pointed upwards, represents growth and rejuvenation, it protects and invigorates it. The color palette carries considerable influence over the perception of the brand, therefore great attention must be paid to the selection process. Natural cosmetics are associated with inner balance, serenity, comfort, and healing—physical and mental. That’s why for Lilay we picked colors that are muted but sill spirited and effervescent, conjuring up images of rejuvenation and living in harmony with nature. The selected palette includes mints, whites, grays, and bright earthen tones. 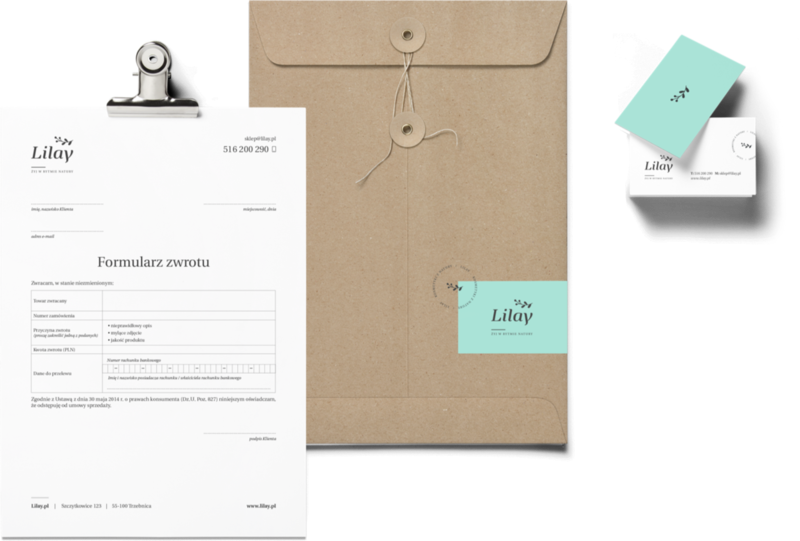 Designing printed materials and stationery for the Lilay brand we not only strove for visual consistency, but also sought balance in harmony in our design element use.  The resulting materials were clear and understated. We chose lighter colors to make the printed materials easier on the eyes and evoke feelings of comfort. We also designed a custom stamp for the brand, to be used on printed materials packaging, and client correspondence. 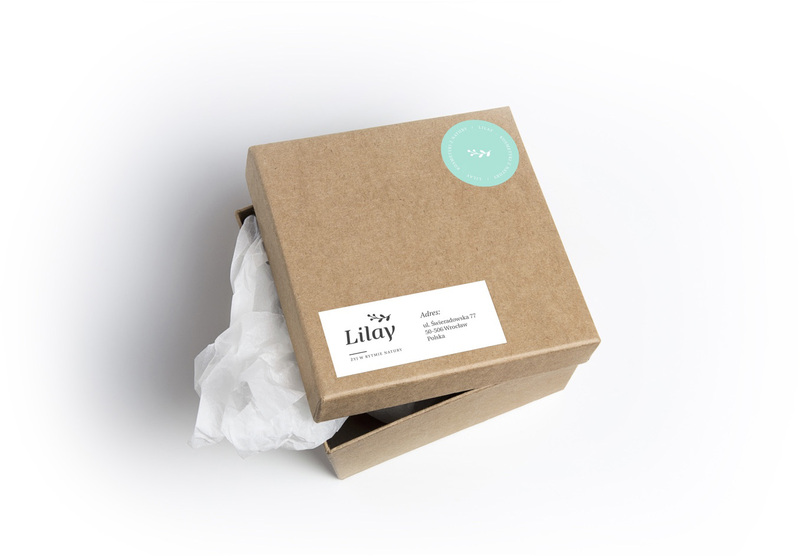 The next step of the Lilay effort involved the implementation of an online commerce platform. Because we wanted to create something tailored to the brand, we ultimately chose to go with a proven, off-the-shelf e-commerce platform and upgrade it with a custom graphic design. An online store has to be useful first and foremost, that’s why we began with drawing up a couple of mockups. 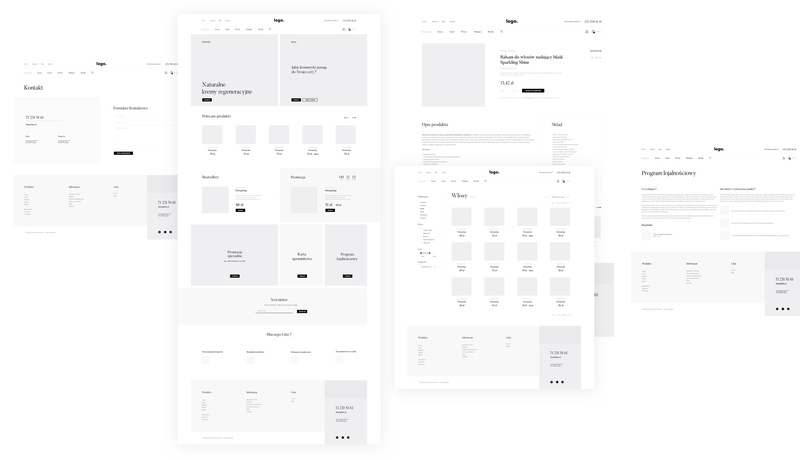 Given that the Lilay brand was established to promote the benefits of natural, organic skincare products, we had to design the platform’s architecture to emphasize it. As a result, the website also includes a blog, while the e-commerce platform features rich product cards with detailed information on the product’s ingredients as well as testimonials from the owners who tested most of their offer personally. The design process was pure pleasure. High-grade brand identity, rich in eye-catching content, and keen awareness of our ultimate objective allowed us to develop clear, crisp designs anchored in the marriage of lighter tones with fresh mints and carefully selected pictures. Delicate yet distinct typography performed its role splendidly and allowed us to place appropriate emphasis on individual elements. Each complexion type has its own individual needs and requires its own beauty regimen. To enjoy healthy, radiant skin, we need to know it and know how to satisfy its particular needs. Each individual portion of your skincare routine, from cleansing, through care, and up to make-up, should involve carefully chosen cosmetics, the selection process taking into account not only the type of complexion they’re intended for but also their ingredients.